Lala Sönam Chödrup (Tib. གླག་བླ་བསོད་ནམས་ཆོས་འགྲུབ་, Wyl. glag bla bsod nams chos 'grub) aka Khenchen Chödrup and Rigtsal Dorje (Tib. རིག་རྩལ་རྡོ་རྗེ་, Wyl. rig rtsal rdo rje) (1862-1944) was a scholar connected with Dzogchen Monastery who was regarded as a speech emanation of Dzogchen Pema Rigdzin. He studied at Shri Singha shedra and gained the title of khenpo, but refused an appointment there, preferring to travel and continue his studies. 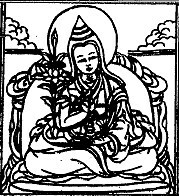 He composed five volumes of writings, including a biography of Longchenpa and works on the Bodhicharyavatara and the Guhyagarbha Tantra. This page was last edited on 9 February 2018, at 18:52.